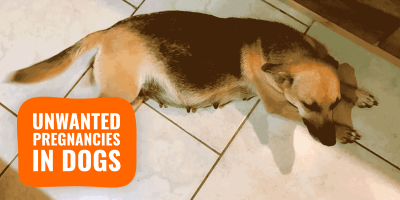 Dog Breeding Concepts — Canine Genetics, Inbreeding, Shows, etc. 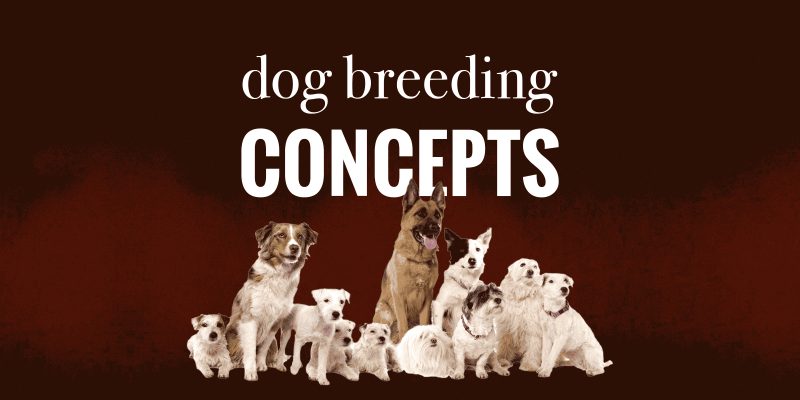 Important Dog Breeding Concepts — Canine Genetics, Heredity, Genotype, Inbreeding, Mutations, etc. As a leading educational platform for ethical dog breeders, we thought it would be a great idea to list all the important concepts pertaining to dog breeding, canine genetics, and other operations linked to running kennels. 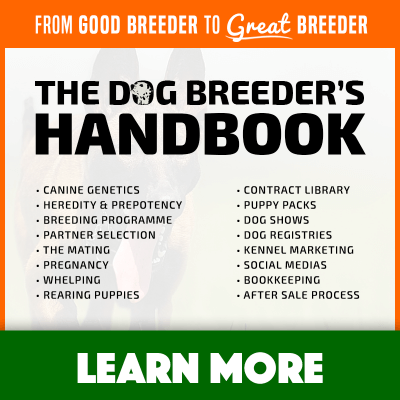 These are the dog breeding basics. 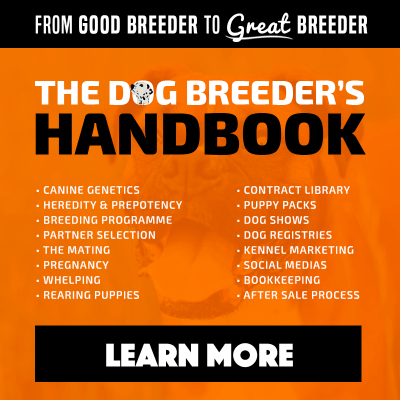 Indeed, when you start getting involved with breeding dogs, you are entering a multi-faceted field so here is a comprehensive list of principles you must master when you decide to breed dog responsibly. Such concepts range from pure canine genetics principles, legal knowledge, trials and dog shows, and a lot more. 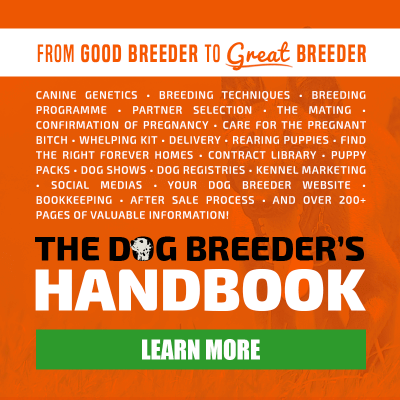 Make sure you grab yourself a copy of our bestseller, The Dog Breeder’s Handbook, as it contains hundreds of pages of updated modern content. But also follow the links in this article to get a more in-depth overview of each concept. Discovered and formulated by Gregor Johann Mendel, the Mendelian Inheritance also referred to as the Mendel’s Principles of Heredity paved the way for classical genetics by biologists and geneticists alike. Formerly applied and tested on pea plants, this rapid-growing discovery on the importance of heredity and hybridization has helped mend the bridge between natural selection and the idea of chromosomes being the sole holder for hereditary agents. Mendelian genetics can be broken down into three distinct structures, or laws. The first law, the law of segregation of genes or chromosomes, describes the process of the separation of pairs of alleles during the process of meiosis resulting in one genetic allele from each parent being passed to the offspring. There’s no way of telling with this law which gene will be passed. The second law, the law of independent assortment, indicates the assortment of genes being separate from one another causing no dependency, or influence, from one inherited gene in one place to another inherited gene in another place, thus making them independent. The third law, the law of dominance, refers to the dominance of particular genes taking precedence in an organism. This law predicts the interaction of genes in the offspring, in which they will inherit the dominant factor from one parent only. Dominant and recessive are terms used to describe the probability of inherited traits and their patterns passed on from parents to their offspring. Alleles are referred to the copies of the genes, with each gene containing two copies, and are basically just different versions of a gene. Determining whether an allele is dominant or recessive depends on the function of their proteins, which affect the gene’s traits. Dominant alleles are expressed by a capital letter, whereas a recessive allele is expressing using a lower-case letter. Dominant phenotypes result from the dominant allele and only one copy from one of the parents is needed. However, for a recessive phenotype to be produced by a recessive allele two copies are needed, one from each parent, which is referred to as being homozygous. If both dominant and recessive alleles are present, the person is said to have a dominant phenotype. However, if the alleles are equal and not showing as dominant nor recessive they are said to be a codominance. If there are more than one recessive or more than one dominant alleles, then an order of dominance will be determined such as one of the two recessive traits will be more dominant than the other. It’s a common misconception that having dominant alleles mean they are necessarily better, nor does it mean they are more common than recessive traits. This is a very simple principle that is rather complex to fully understand. Yet, mastering and feeling at ease with dominant and recessive alleles in dogs is the most basic requirement for a dog breeder. So many traits, health conditions, and characteristics of dogs are defined by their genetic makeup (i.e. genes, alleles). Therefore, partner selection and genetic testing happening before breeding rest almost exclusively on this principle of recessive vs dominant alleles in dogs. A dog’s genotype refers to the set of hereditary genes that makes up its entire genetic makeup. It’s the genotype that is responsible for the traits produced by the alleles in a gene. The genotype can describe sets of genes or one gene itself. In terms of evolutionary purposes, breeders need to consider the genotype of the dog breed. Therefore, it’s the DNA’s genotype that determines what makes one animal different from another. Unlike the phenotype, in which the physical characteristics of the dog are distinguished by mere observation, the genotypes are only determined by biological testing. In regards to breeding and genotypes, some of the challenges that may arise are that some of the inherited genes cannot be detected and are unknown, such as certain recessive genes that only show up later down the generational line. Through a process called personal genome sequencing, a breeder can identify the complete genome of a dog. 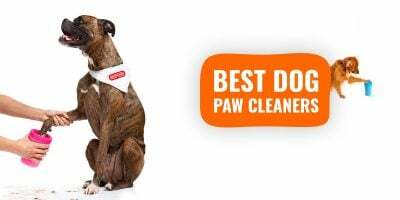 It has been proven to be an added benefit by giving a thorough analysis of a dog’s genes all at one time because it produces more in-depth results. Especially in revealing certain aspects of the ancestry line and genes that may contain unknown functions. This is actually helpful for determining the relationship with their health such as gaining information regarding disease and thus, prevention. Unlike the genotype of a dog, the phenotype makes up the physical characteristics and traits that are physically recognized and observable. The phenotype of a dog is influenced by both environmental factors and the genotype, which is actual DNA composition of the genes. When you look at a dog and take note of the characteristics and physical attributes you are staring at the dog’s phenotype. And it is a direct result and outward expression of the genotype trait. Examples of phenotypes include the coat’s color, the color of the eyes, the shape of their heads, specific behaviors or even the sound of the dog’s bark. Breeders will take into consideration the phenotype of a dog in order to produce the desired physical traits they want in their dog. Therefore, breeding for appearances is known as assortative matings which can be positive in which two are alike, or a negative mating in which they are different. Successful breedings should have a combination of both appearance and consideration of genotype. At least with its direct correlation with its genotype, the phenotype can quite easily be detected by familiarizing with the genotype first. However, since the phenotype is determined by two factors, one can easily mistake a physical trait to having been caused by a genotype, whereas it likely may have been an environmental cause. An example of such misunderstanding is a very athletic or fast dog; some could believe this is a genetic trait while it generally results from intense exercising and appropriate dieting. For lazy breeders, looking at a dog’s phenotype and deciding which dog to mate it with is the easy way out. Both dogs would literally look like they would give a good litter of puppies. Yet, the surest way to figure such things out is by understand both genotypes, generally by studying pedigrees (if all ancestors were fast and muscular dogs, chances are it’s in the genes indeed). If you are a little confused about genotypes and phenotypes, check out this two-minute video! Genes are the basic instructions of our DNA and are made up of protein-coded sequences that act as building blocks. As parents pass on their genes to the offspring, some errors may occur causing genes to mutate, or produce incorrect copies of the original. These mutated genes have been largely responsible for causing adverse ailments such as serious diseases in the form of cancer or diabetes, as well as many forms of psychiatric illnesses. The major problem with these mutations is that all it takes is one bad gene to replicate and make copies of itself to be passed onto future generations, causing a long string of that inherited trait. The severity of the mutation depends on the error, some may not even show up or have an effect at all, and yet, others can cause debilitating lives in dogs, therefore not all mutations are bad or even noticeable. A dog’s gene pool refers to the entire makeup of genes that have been compiled since the original dogs that were bred. The original dogs that are incorporated into a stud book set the breeding line for future generations and purebred dogs. Therefore, all the dogs proceeding will have a mix of the traits of only these dogs with no outside influence. This causes less variation in genes, but more predictability. This is what is referred to as having a closed gene pool, and gene pools do not get bigger, except for the rare instances of gene mutations, which can rarely cause a slip up in one of the future dogs. However, it is possible for gene pools to get smaller due to natural selection. Genes of a certain trait can become halted, especially if they are recessive. Generally, if the gene pool is big to start with it offers more genetic diversity whereas a small gene pool can lead to a reduced biological fitness or lead to extinction itself. Small gene pools increase the chances of diseases to spread more widespread within the breed. Purebreds also termed as true-breeding organisms, pass down their traits throughout many generations. To be considered true breeding in accordance with Mendelian genetics, the pair of alleles expressed in the trait needs to be equal which is referred to as being homozygous, giving rise to the name “breeding true”. Breeding animals until they produce homozygous traits allows for the purity of the breed to reproduce and gives breeders a reference for predictable breeding results. It does not mean that the purebred dog is necessarily better, it just means they provide a trusted background of parental traits. Additionally, crossbreeds or hybrids of two purebreds, are not considered true breeding dogs; mixed breeds do not possess known heredities. Purebred dogs (pure blood) are breeds that possess stud books containing their pedigrees and are usually registered in breed clubs and kennel clubs. Purebreds pose a challenge in which it is required that they are bred from two dogs that share the same gene pool which can already be fairly limited. Purebreds are also known to suffer adverse effects of inbreeding as well, yet they are usually sought out for their rich pedigree and physical characteristics. Breed standards set the bar in terms of intimately knowing your purebred dogs. With a breed standard, you have a written presentation of the ideal candidate you want. Kennel clubs normally set the standards for breeds and then parents and other club members assist in the process by voting. The result becomes the blueprint of a purebred dog breed. This information is then processed and used for performance purposes at dog shows. The inbreeding of dogs can be traced back centuries ago. It was done back when our ancestors began realizing the benefits inherited by the mating of certain dogs to produce certain traits. Thus leading to a purer bloodline of their favorite working breed. It was amongst the dog breeding basics of older generations. In fact, it’s because of inbreeding that we have many of our modern-day breeds today. Inbreeding involves the mating of very close relationships, such as siblings or parent to offspring, and are determined by a coefficient number to distinguish the probability of certain traits being produced and to help determine how common the ancestors are. 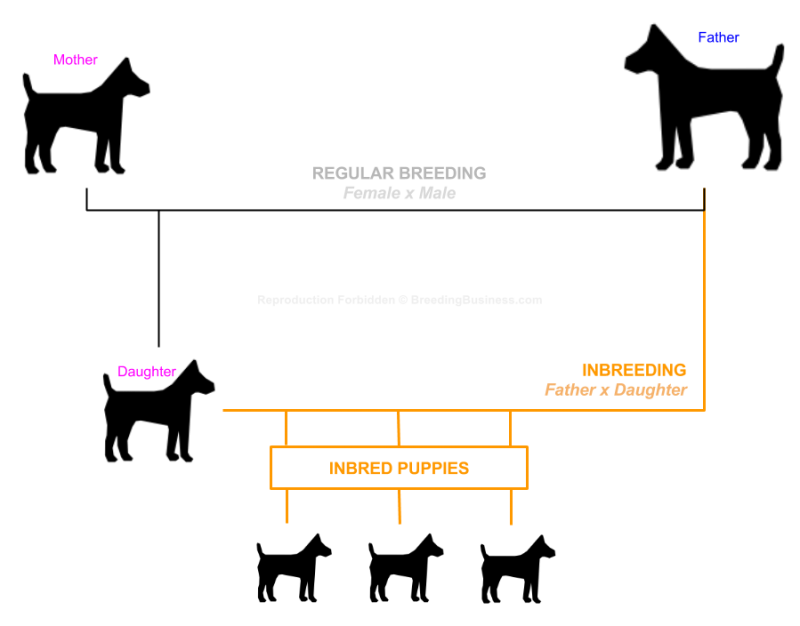 Diagram showing inbreeding in dogs (father-to-daughter). The main reason breeders decide to inbreed is due to the fact that it provides a steady way through selective breeding of isolating desired traits of the animal for reproduction in future generations. These desired traits can range from working abilities to physical characteristics or behavioral temperaments. Such traits can be prime for a dog breeding business as they will be in higher demand due to their specialization and consistent occurrence in the puppies produced by the said breeding. 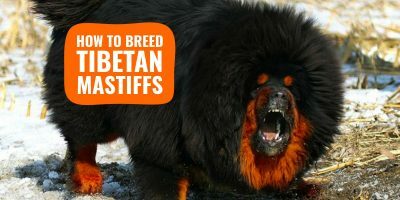 Although the isolation of desirable traits can be a great advantage, for the most though, the act of line-breeding is a highly controversial subject. In fact, the risks tend to outweigh the benefits. Just as it is possible to produce positive traits, it works the same way for negative traits. First off, inbreeding causes a very small gene pool. Additionally, inbreeding raises the probability of the recessive mutations. Many hidden traits can be passed along through inbreeding that are not easily detected often causing disease in the offspring later on in the years. Furthermore, many congenital defects such as hip dysplasia as well as fertility issues are common among inbred dogs. When it comes to breeding for specific traits, a breeder will tend to consider the inherited genetic material of the dog. However, a successful breeder is one who understands the influence of the environment, which is referred to as “nurture”. The nurturing of a dog involves the formative years, situations and households in which it was brought up with, and the social interactions with other dogs, parents or breeder. All these experiences help shape how the genes are expressed. So does air pollution, diet, exercise, and so on. With dogs, the mothers tend to have more influence on the puppies than the father, therefore just like with human parenting, the mother must be stable enough to teach and guide her offspring to become mature and mentally stable adults. Likewise, the breeder or dog owner will have an influential impact on the dam, in turn, influencing the offspring. It is important that the breeder maintains a healthy relationship with all dogs to ensure successful nurture. This is often seen in dogs who have been deprived of a social life or have been abused, it drastically affects how they treat others in the future and prove to be substantial threats and problems to the breeder and thus, are not fit for future breeding purposes and business. A studbook is basically a registry. The name is often called a herdbook or more specifically, a breed registry. A stud book registers male dogs that are equipped to breed and contains each dog’s papers, or pedigree. Such documents detail the dog’s ancestral history and give a thorough scope of its breeding background. They can contain the names of the male and female breeding dogs, names of ancestors, the color, addresses, or even information regarding past litters. The two main types of stud books are closed and open. In a closed stud book registration, the results of breeding are more controlled. This is due to having no variation in the genetics, and having the dog’s history thoroughly observed, which make them ideal candidates for enhancing specific desired traits in the breed. Oftentimes, to increase these chances, the dogs are inbred. These dogs tend to be bred for conformation. In an open stud book registration, however, dogs are more diverse and outcrossing is usually practiced. These dogs are usually found in the work fields such as guarding, police or herding. Such lines are bred for their skills rather than their look so as long as the dogs perform at an excellent level, they should be allowed to register in that studbook. The pedigree of a dog may be one of the most important concepts in a dog breeding business. And it is certainly a must-have document for all dog buyers. All the important and desired aspects of a dog such as intelligence, health, and beauty are contained within a dog’s genetic background so having a pedigree will help determine these factors with more assurance. 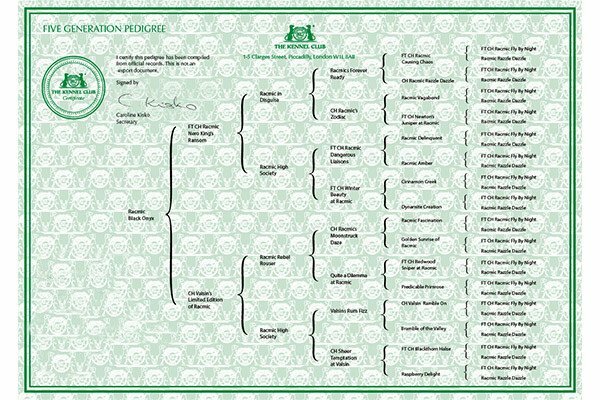 What an official American Kennel Club pedigree certificate looks like. No buyer should ever purchase a dog without doing a thorough background check on the dog’s history and ancestry. Likewise, no breeder should consider selling a dog without having its pedigree readily available which will show buyers that he is serious and cares about quality. Basically, the pedigree is the family tree of the dog which can be traced back to several generations for each parent. That way, a person knows exactly what they’re getting when they choose their pet. If you can picture a diagram of a dog’s family tree you can see that it starts with the line of the desired dog and works its way to the right with the line of the previous generation and so on. When looking to buy a dog with a pedigree, look for certain factors such as relatively attractive registered names or initials and show titles after or before the names. Perform a pedigree analysis to get the complete scope on all the individual members. With this analysis, you can gain information regarding success rates in dog shows or even highly demonstrable abilities and talents. Just keep in mind that you will have to consider paying the higher price for lines who contain a rich history of champion dogs. Canine pedigrees are useful to breeders because they allow them to check for patterns. If you are trying to breed very fast racing greyhound dogs, you may want to consider a stud if most of his ancestors are very lean, fast, and muscular. By researching the specimens mentioned in a dog’s pedigree, you can view a range of phenotypes and assume how much of it is genetic, and how much of it is nurture. Dog breeding is a business and quite a lucrative one at that as long as you master the basics of breeding dogs. Yet, it’s definitely not an easy one to manage. 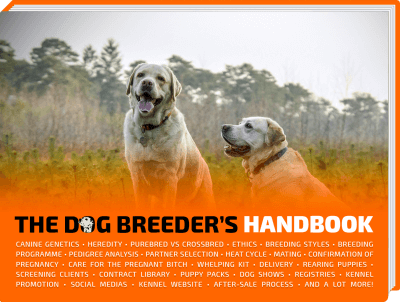 Many breeders get into this trade not fully prepared, without having an organized plan. Despite their best efforts, the business takes an early departure. determine what you don’t want and hope to avoid. As simple as it sounds, determining what you want requires lots of research on your part and the subsequent work that you need to put in. Determine exactly your main objective with breeding, like what traits you wish to produce and why. Then evaluate all that can go wrong and assess exactly what you want to avoid so you don’t run into problems in the long haul. Breeding is a long-term commitment! Next, you need to find the right breed of dog that will produce what you want and will not produce what you don’t want. This is the most important part and you need to reach out to professional dog breeders or judges to help you find them. You need a qualified dam (female) and a qualified sire (male) in order to start your breeding business so make sure you do your research on the mate as well. Starting Your Kennel? Get Our FREE Mind Map! 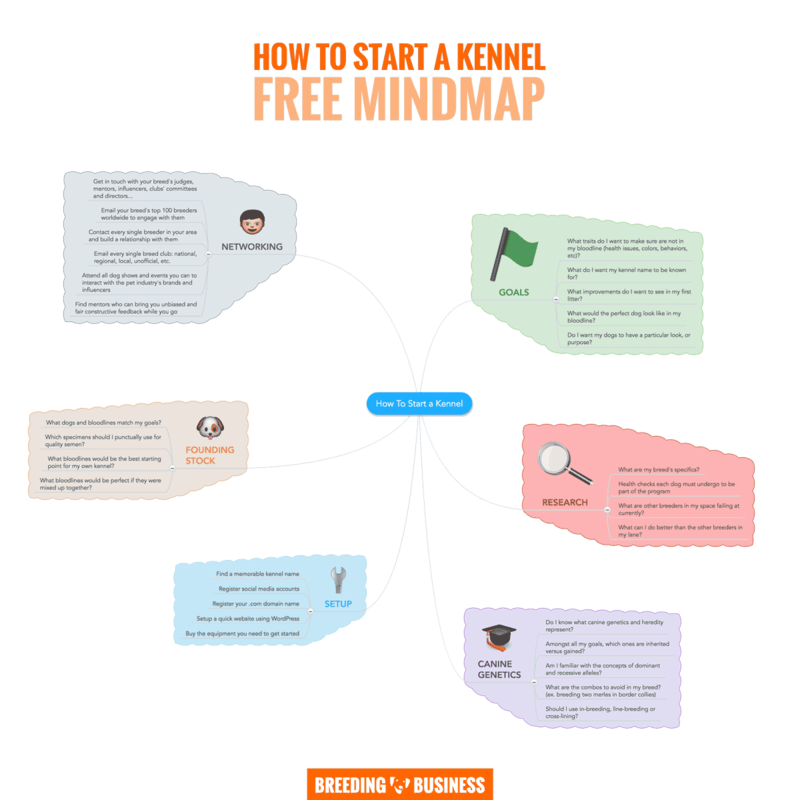 This FREE mind map helps you get started with the right way. It asks all sorts of questions you should start answering! Dog shows are very common in the dog world and are a great way to showcase your dog’s talents and abilities to show the world that you have something worth investing in. Shows are designed to give purebred dogs a chance to compete against one another, according to the standard of their breed, for sets of skills that are desirous for people who breed and buy dogs for a living. Two of the most well-known dog shows are the Westminster Kennel Club Dog Show, and the British Crufts, which happens to be the largest of all. Conformation dog shows (breed ring shows) are specifically meant to showcase how dogs of a certain breed conform to that specific breed’s official standard. Breeders are especially inclined to attend these shows and choose among the championships because these championships communicate that the dogs hold a lot of value for breeding purposes. Dogs who excel in the shows and win a predetermined number of competitions are awarded championship titles which adds a CH prefix registered to their name to help identify them to breeders. The level of performance of some more work-oriented breeds is judged in trials such as competing for agility, hunting, obedience, herding, and weight pull championships.